"It sickens me to have to stand there and listen to your lies." A24 has debuted the first official trailer for a true story political drama titled Backstabbing for Beginners, from Danish director Per Fly. The film is about a young, idealistic program coordinator at the United Nations, as played by Theo James (from the Divergent series), who stumbles upon a conspiracy involving Iraq's oil reserves. Ben Kingsley stars as his boss, and the cast includes Jacqueline Bisset, Christina Dupre, Rossif Sutherland, Belçim Bilgin, Rachel Wilson, and Brian Markinson. This looks like a very compelling political thriller about a kid just trying to do what's right. And, as A24 says in their email, it's a very "timely" film for us to watch these days. Based on a true story, an idealistic young employee (Theo James) working at the UN investigates the grisly murder of his predecessor and uncovers a vast global conspiracy, that may even involve his own boss (Ben Kingsley), in this gripping and timely thriller. 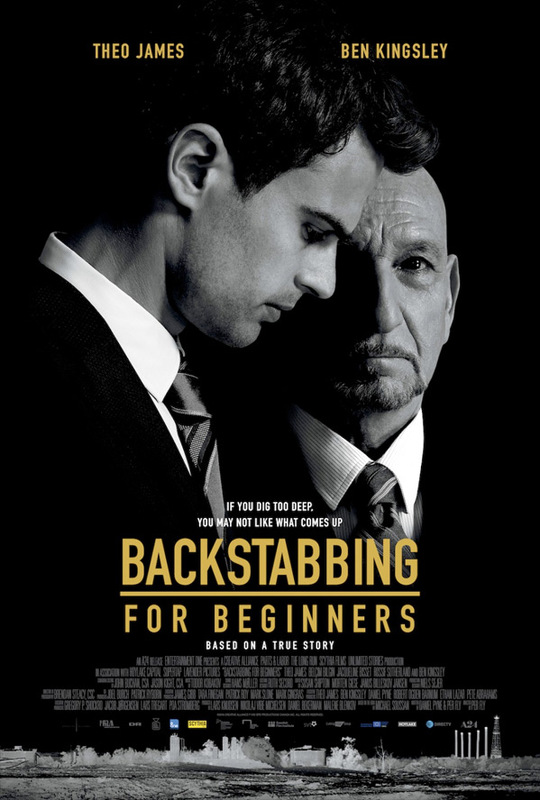 Backstabbing for Beginners is directed by Danish filmmaker Per Fly, of the films The Bench, Prop and Berta, The Inheritance, Drabet, The Woman Who Dreamed of a Man, and Monica Z previously. The screenplay is written by Per Fly and Daniel Pyne, based on the memoir by Michael Soussan. The film already opened in Denmark in January. A24 will release Fly's Backstabbing for Beginners in select theaters + on VOD starting April 27th this spring. Who's interested?